Friday December 7th 1877 We got the work done up as quick as possible this morning and sent for Mrs Dennison to spend the day. We had a real pleasant visit Uncle Jim Stevens came for Hattie to go home with him. I helped get supper over and played whist in the evening. 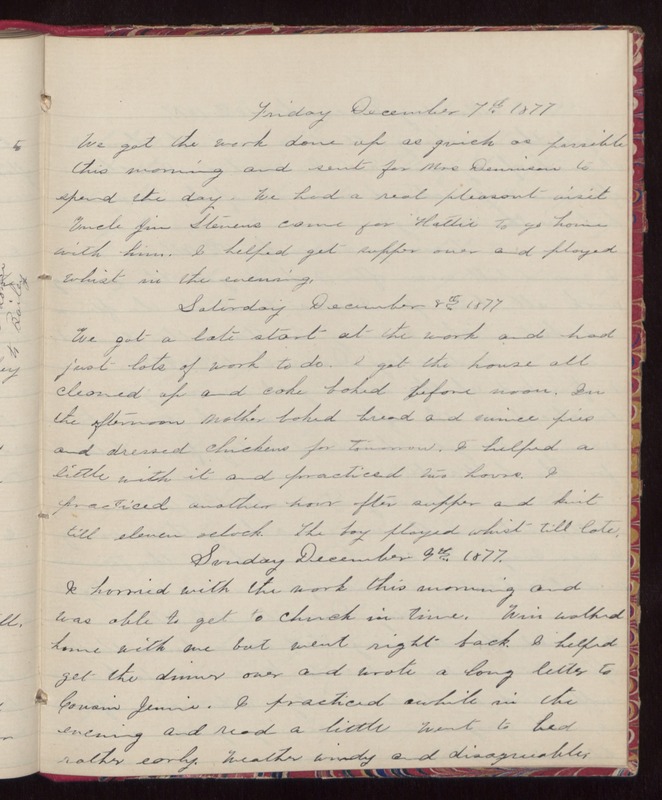 Saturday December 8th 1877 We got a late start at the work and had just lots of work do do. I got the house all cleaned up and cake baked before noon. In the afternoon Mother baked bread and mince pies and dressed chickens for tomorrow. I helped a little with it and practiced two hours. I practiced another hour after supper and knit till eleven oclock. The boy played whist till late. Sunday December 9th 1877. I hurried with the work this morning and was able to get to church in time. Win walked home with me but went right back. I helped get the dinner over and wrote a long letter to Cousin Jennie. I practiced awaile in the evening and read a little Went to bed rather early. Weather windy and disagreeable.